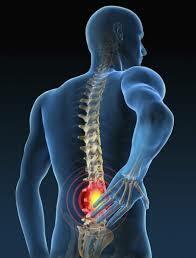 Why sitting is the worst for (most) lower back pain. As a follow-up to our last post about lower back pain, I wanted to share with you another great tip to help with lower bak pain while sitting. For most episodes of lower back pain, symptoms are usually aggravated by bending forwards, such as tying our shoes, and putting our pants on first thing in the morning. Why? This ‘flexing’ of the spine puts increased pressure on your discs, and also stretches the ligaments/joints of your spine. If these tissues are already injured/irritable, these motions cause further aggravation. And, because of the tendency to slouch while sitting, this ‘flexing’ motion can really aggravate symptoms, and make recovery take longer.. But in ‘real life’, I still have to sit . . So what can I do? This initially sounds like a silly idea, but the goal is to keep your spine in a neutral position when sitting- i.e. to maintain a slight amount backwards bending. We call this lordosis, and this position alleviates spinal ligament stress, and allows the discs to accept pressure the way the spine was designed to do. This lordosis is commonly achieved by tilting the pelvis forwards while seated. The goal of the sitting surface then is to have the knees lower than the hips. 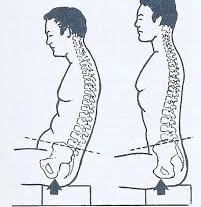 By raising your chair, and getting your knees lower than your hips (and feet flat on the floor), it allows your pelvis to naturally tilt forwards (see image below on the RIGHT below), and maintain lordosis with much less effort. When our hips are higher than our knees (such as when sitting on the floor, or in a low or soft chair), it causes our pelvis to rotate backwards, increasing flexing of the lower back- ouch! Simply put: For every 20minutes of sitting, stand up and take a 20second break, and walk around to reverse this position. It acts like a reset and refresh to your back. Try out this easy, simple sitting ‘trick’ for a healthier lower back! In general, if your lower back symptoms persist more than 2+ weeks, it’s best to give us a call so we can assess and make sure there is nothing more serious going on. Most of the time, only a few PT visits is enough to get you back on track (pun intended! ), and quickly back to activities you love, without need for medications and painkillers. Give us a call 503-904-9038 or reach out, and we’d be happy to get you back to enjoying your Summer activities. . . pain-free!